Fashionable clothing retailer Fat Face have announced the official opening of their new store on Battle High Street. To celebrate their arrival, the outdoor lifestyle brand is inviting local shoppers to come down tomorrow (Saturday, June 25) for the grand unveiling, where a lucky customer will also be in with the chance of winning a gift card worth up to £250. Fat Face have grown as a company since 1988, when it started off as two friends designing sweatshirts in the French Alps. Now the company boast 194 national stores and several more overseas, selling clothes for men, women and children. The Battle store, previously occupied by Boots, was historically an old independent pharmacy dating back to the 12th Century (restored in the 17th Century) and, as described by Fat Face, "is absolutely bulging with character." Quirky features including: an old plaque and door bell on the front of the building; beautiful cobbled flooring; exposed brickwork; and original fireplace have all been left and incorporated into the new décor, which is very much inspired by its heritage. The overall finish encompass a home-from-home environment, with the use of vintage furnishings sourced from local retailers, as well as other kitsch finishing touches. The store has already created 8 jobs for young local residents and may even look to recruit more once it has officially opened. Sara Parrish, Area Manager for the South Coast, said: "We are thrilled to be opening in Battle; it's such a lovely town with massive tourist appeal. "There's a great selection of little niche shops and boutiques already on the High Street, which we feel very privileged to be sat alongside of. "We really hope that the new store will be well received by Battle shoppers and we can't wait to become part of the local community." 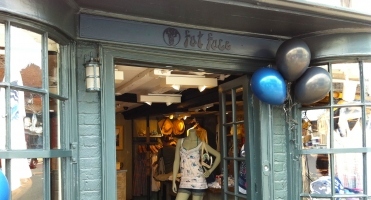 Newly appointed President of Battle & District Chamber of Commerce, Dale Cromwell, added: "While of course our independent businesses are a big draw to the town, I am extremely pleased that Fat Face has chosen Battle to add to its stores in Lewes, Tunbridge Wells and Tenterden. "They will fit in well with our existing fashion outlets and are a welcome presence on the High Street. It's good news for the town and will bring a whole new customer base, whilst providing local jobs for local people. "I really hope to encourage Fat Face to become active members of the Chamber and join us in our current and future initiatives."